Nedávno som na internete prišla k jednému anglickému článku, asi z akejsi kroniky alebo starého textu. Ten text bol v angličtine a písalo sa tam o tom, že „Slovania sa nemnožia rodením (ako ľudia), ale rozosievaním semien ako rastliny“. Pozná niekto takýto zápis? Rada by som poznala zdroj, lebo to je podľa mňa odpoveď na to, prečo sa Slovania tak veľmi rozšírili po Európe… bola za tým populačná explózia… asi taká, akú teraz zažívajú muslimovia. Pokiaľ sa dobre pamätám, tak kľúčové slová boli „Slavs don’t multiply(?) by birth/being born(?) like humans/human beings/animals(?) but disseminate/by seeds(?) like plants/trees(? )“ Tri dni mi to viselo na očiach a ja som si nepoznačila zdroj. Šľak ma ide trafiť. :))) Ak niekto vie nájsť tento zápis, tak sem s ním. Veľká vďaka. V knihe akademika Deržavina „Slavania v dávnej minulosti“ na strane 30 sa podotýka vyjadrenie bavorského geografa z 9.storočia, že Slovania sa nerodia, ale klíčia, nakoľko bol udivený ich početnosťou. Názov SPORI bude odvodený od mena ich vládcu. Akurat, ze ROSSIJAN nie je pomenovanie Rusa. Pomenovanie Rusa v rustine je RUSSKIJ. 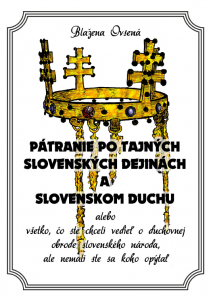 ROSSIJAN je obcan Ruskej federacie akejkolvek narodnosti vratane tych par stoviek neslovanskych narodov, ktore tam ziju. Píše se rok 536 našeho letopočtu a byzantský historik Prokopius přijel do jižní Itálie. V té době se rovnováha sil ve Středomoří neustále měnila: Vandalové dobyli Řím v roce 455 a v roce 476 zkolabovala západořímská říše. Císař Justinián I. Veliký je rozhodnut získat zpět ztracená území. Po úspěšném tažení proti severoafrickému království Vandalů začátkem 30. let 6. století vyslal císař armádu k opětovnému dobytí Itálie. Podle záznamů Prokopiuse se ale stalo něco neobvyklého. Slunce potemnělo a šero trvalo déle než celý rok. Uprostřed léta mrzlo, byl sníh a zima vlastně neskončila. Od Itálie po Irsko a od Číny po Střední Ameriku zahájil rok 536 deset let trvající období globálního ochlazení. Nastaly nepokoje. Náboženství ztrácela věřící, města kolabovala a největší morové epidemie v dosavadní historii usmrtily čtvrtinu obyvatel Byzantské říše. Téměř ve všech částech světa bylo toto období poznamenáno špatným počasím, sociálními nepokoji a smrtí. Tato klimatická změna zcela jistě změnila průběh dějin. Spouštěcí mechanismus tohoto deset let trvajícího chladného období byl dlouho záhadou. Ak sú moje závery správne, tak velké ochladenie a zatmenie Slnka ku ktorému došlo v rokoch 535-536 úzko súvisí zo smrtou legendárneho kráľa Artuša v Británii na bojovom poli v podmienkach ktoré boli ešte horšie ako počas tridsatročnej vojny, chlad, zima, neúroda a neustále dažde…. Zem zasiahla na 10 rokov malá doba ľadová. At the opening of spring (536 A.D.), when the Christians were celebrating the feast which they call Easter, there arose a mutiny among the soldiers in Libya. I shall now tell how it arose and to what end it came. After the Vandals had been defeated in the battle, as I have told previously, the Roman soldiers took their daughters and wives and made them their own by lawful marriage. And each one of these women kept urging her husband to lay claim to the possession of the lands which she had owned previously, saying that it was not right or fitting if, while living with the Vandals, they had enjoyed these lands, but after entering into marriage with the conquerors of the Vandals they were then to be deprived of their possessions. And having these things in mind, the soldiers did not think that they were bound to yield the lands of the Vandals to Solomon, who wished to register them as belonging to the commonwealth and to the emperor’s house and said that while it was not unreasonable that the slaves and all other things of value should go as booty to the soldiers, the land itself belonged to the emperor and [10-17] the empire of the Romans, which had nourished them and caused them to be called soldiers and to be such, not in order to win for themselves such land as they should wrest from the barbarians who were trespassing on the Roman empire, but that this land might come to the commonwealth, from which both they and all others secured their maintenance. This was one cause of the mutiny. And there was a second, concurrent, cause also, which was no less, perhaps even more, effective in throwing all Libya into confusion. It was as follows: In the Roman army there were, as it happened, not less than one. thousand soldiers of the Arian faith; and the most of these were barbarians, some of these being of the Erulian nation. Now these men were urged on to the mutiny by the priests of the Vandals with the greatest zeal. For it was not possible for them to worship God in their accustomed way, but they were excluded both from all sacraments and from all sacred rites. For the Emperor Justinian did not allow any Christian who did not espouse the orthodox faith to receive baptism or any other sacrament. But most of all they were agitated by the feast of Easter, during which they found themselves unable to baptize their own children with the sacred water, or do anything else pertaining to this feast. And as if these things were not sufficient for Heaven, in its eagerness to ruin the fortunes of the Romans, it so fell out that still another thing provided an occasion for those who were planning the mutiny. For the Vandals whom Belisarius took to Byzantium were [17-23] placed by the emperor in five cavalry squadrons, in order that they might be settled permanently in the cities of the East; he also called them the „Vandals of Justinian,“ and ordered them to betake themselves in ships to the East. Now the majority of these Vandal soldiers reached the East, and, filling up the squadrons to which they had been assigned, they have been fighting against the Persians up to the present time; but the remainder, about four hundred in number, after reaching Lesbos, waiting until the sails were bellied with the wind, forced the sailors to submission and sailed on till they reached the Peloponnesus. And setting sail from there, they came to land in Libya at a desert place, where they abandoned the ships, and, after equipping themselves, went up to Mt. Aurasium and Mauretania. Elated by their accession, the soldiers who were planning the mutiny formed a still closer conspiracy among themselves. And there was much talk about this in the camp and oaths were already being taken. And when the rest were about to celebrate the Easter festival, the Arians, being vexed by their exclusion from the sacred rites, purposed to attack them vigorously. – Books 3 and 4, the wars with the Vandals. Abstract: It was a catastrophe without precedent in recorded history: for months on “ end, starting in A.D. 535, a strange, dusky haze robbed much of the earth of normal sunlight. Crops failed in Asia and the Middle East as global weather patterns radically altered. Bubonic plague, exploding out of Africa, wiped out entire populations in Europe. Flood and drought brought ancient cultures to the brink of collapse. In a matter of decades, the old order died and a new world― essentially the modern world as we know it today―began to emerge. In this fascinating, groundbreaking, totally accessible book, archaeological journalist David Keys dramatically reconstructs the global chain of revolutions that began in the catastrophe of A.D. 535, then offers a definitive explanation of how and why this cataclysm occurred on that momentous day centuries ago. The Roman Empire, the greatest power in Europe and the Middle East for centuries, lost half its territory in the century following the catastrophe. Meanwhile, as restless tribes swept down from the central Asian steppes, a new religion known as Islam spread through the Middle East. As Keys demonstrates with compelling originality and authoritative research, these were not isolated upheavals but linked events arising from the same cause and rippling around the world like an enormous tidal wave. Keys’s narrative circles the globe as he identifies the eerie fallout from the months of darkness: unprecedented drought in Central America, a strange yellow dust drifting like snow over eastern Asia, prolonged famine, and the hideous pandemic of the bubonic plague. With a superb command of ancient literatures and historical records, Keys makes hitherto unrecognized connections between the „wasteland“ that overspread the British countryside and the fall of the great pyramid-building Teotihuacan civilization in Mexico, between a little-known „Jewish empire“ in Eastern Europe and the rise of the Japanese nation-state, between storms in France and pestilence in Ireland. In the book’s final chapters, Keys delves into the mystery at the heart of this global catastrophe: Why did it happen? The answer, at once surprising and definitive, holds chilling implications for our own precarious geopolitical future. Wide-ranging in its scholarship, written with flair and passion, filled with original insights, Catastrophe is a superb synthesis of history, science, and cultural interpretation. Iordanes v Getice píše o Venedoch (ktorí sa delia na Sclavenov a Antov = Ostarnov = Vostarnov = Bastarnov = Drevľanov). Fíni a Estónci volajú dodnes susedných Slovanov, Rusov, ako vänälainen / venelanen (= Rus). „Onemecké“, „rakúsko-uhorské“ prídavné meno windisch, asi bude len náhodné významové priblíženie sa k „rozviati“, lebo v dnešnej „onemčine“ Lužický Srb sa volá der Wende (die Wende = obrat, „otoč“) a prídavné meno lužickosrbský = wendisch. Zaujalo ma, že v estóčine vend = brat ( vo fínčine je to veli ). Slovani učili týchto „ugrofínov“ jesť lyžicou, t. j. LOŽICOU, lebo po fínsky lyžica = lusikka, a po estónsky lusikas !!! Metod, v tomto kontexte by germánske pomenovanie Slovanov – Windisch – mohlo dostávať iný význam, ako sme ho vnímali doteraz, a to rozviati, lebo Wind je vietor. Bola by to germánska obdoba Sporoi (Sroboi/Srbov). Milo tu nejde o „proces rozsievania“, ale o skutočnosť, že daktorý starý Grék zapísal meno národa žijúceho severne nad Grékmi gréckym slovom SPOROI, ktoré má význam „tí rozSIATI“, no a do dnes severne nad Gréckom žije národ ROSSIJANI – a to napriek tomu, že „oficiálne“ Slovania sa „zjavili“ až v cca 5. storočí, i keď už v cca 2. storočí Ptolemaios v mieste, kde dnes žijú „Rossijani“, a dakedy tam, podľa starých Grékov“, žili „Sporoi“, umiestňuje národ SOUOBENOI !!! To meno Souobenoi je možné z mnohých dôvodov čítať jedine ako SLOVENI !!! v ktorom meno Sueui možno čítať jedine ako SLEVI (Slävi), a nie ako akýsi hypotetickí germánsky Svebi, z ktorých by mali pochádzať dnešní Švábi v Bavorsku / Bavorskej spolkovej republike. od rieky BOJA !!! !!! !!! Vedeli by ste nam napisat aj ako to rozosievanie cele prebieha v praxi? Čo, keby ste nám to aj preložili? Veľká vďaka, Metod, veľmi ste mi pomohli. Ešte dodám, že názov zdroja je Descriptio civitatum et regionum ad septentrionalem plagam Danubii. Ten zápis po latinsky je vo forme poznámky na konci najznámejšej verzie popisu susedov Vrankskej ríše od Geografa Bavorského – viď napríklad tu http://skutocna-historia-slovanov.blogspot.sk/2016/10/jablkosvaru-madar-uhor-alebo.html, a znie „Sueui n(on) s(unt) nati, s(ed) seminati.“ = Slävi nie sú rodení, ale siatí (od siať)!!! Tu treba PAMäTAŤ NA GRÉCKE „sporoi“ A samozrejme NA pomenovanie Rusov „ROSSIJANI“(roz(o)siatí)!! !